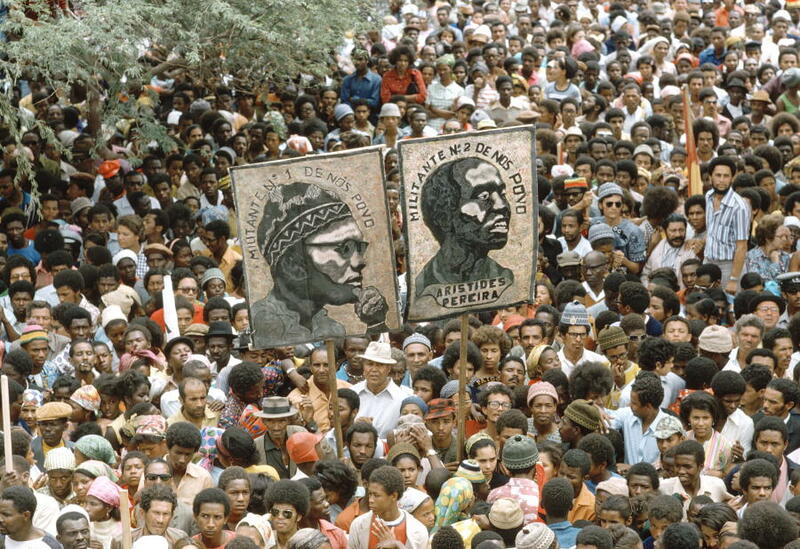 Cape Verdeans in large numbers gather in Praia, Santiago Island. Picture taken a few months before proclamation of independence in 1975. Today, the fifth of July, marks the 40th anniversary of Cape Verde’s independence. Portuguese rule over the Cape Verde islands has been longlasting (since 1462!) and influential in many important aspects, not the least ancestrywise but still it must be put into context. Fullblown colonial control has been mitigated to a great degree because of Cape Verde’s relative seclusion within the Portuguese Empire and also the emergence of locally born and often racially mixed elites. Especially throughout the 1600’s/1700’s Cape Verde was basically left to its own devices untill the appearance of a more modernized imperialism in the mid 1800’s. This pretty much enabled most Cape Verdeans to structure their everyday lives according to their own preferences in many ways, obviously given restrictions of natural resources, geography, climate etc. Key elements of their Upper Guinean heritage were fused with institutions derived from their partial Portuguese and/or Sephardic ancestry and resulted in a prime example of Creolization. See this page for a listing of sources and recommended reading. The historically very low share of Portuguese born settlers on the Cape Verde islands. Probably never surpassing 5% of total population, except perhaps during the very first century of colonization (1460-1560). The racially mixed, socalled mulato segment of the population seems to have increased mostly by way of natural endogamous growth since the 1500’s/1600’s aside from a minor but continued geneflow from Portugal and at times other European countries throughout the 1700’s/1800’s. Unlike Brazilians or even many Angolans the mother tongue of Cape Verdeans is not Portuguese but rather Kabuverdianu, a Creole language, Portuguese-based but modified by many Upper Guinean influences (see this page for more discussion). This national language serves as a key marker of Cape Verdean identity despite island variations. Perhaps most importantly a clear majority (>80%) of Cape Verde’s population was no longer enslaved at least since the census of 1731 and most likely already since the late 1600’s. The socalled Badiu’s on the island of Santiago probably formed some of the earliest Maroon communities in the Afro Diaspora, fleeing and defying colonial rule already since the early 1500’s! In addition there was a high incidence of manumission for both black and racially mixed Cape Verdeans because of local factors (see this page for more details). Not so much significant in numbers but still symbolically evocative is the historically documented presence of free Upper Guineans who settled in Cape Verde out of their own will from the earliest periods, going back to the 15th century even! When according to both ancient folklore and historical reports a Wolof prince and his entourage from Senegal landed on Santiago island and decided to remain (Carreira, 1972). Is the 1856 slave census representative of Cape Verde’s ethnic roots? For an immediate answer to the question how representative the 1856 slave census (displayed in the first and second chart above) might be for Cape Verde, we can just simply look at the percentage of African born slaves in this census (17%) as well as the percentage of slaves in the total population around this time (5,8%). Doing the math we can easily come to the conclusion that strictly speaking the ethnic origins specified in this 1856 census only cover about 1% of total Cape Verdean population. Which would be the approximate proportion of African born people in Cape Verde, obviously a vast majority therefore being locally born and “native” to Cape Verde for many generations. It is still likely that many of the “creole” slaves are only 1 or 2 generations removed from mainland African born ancestors and possibly also many manumitted slaves at that time. Because of their history of early creolization and sharply decreasing enslavement since the late 1600’s most Cape Verdeans will however have to trace back much earlier than 1856 to find their African born ancestors whose ethnic composition is naturally going to show overlap with the data shown above but proportionally things could very well be different. For more details read this previous blogpost: From Creole to African, as well as Top 20 Ethnic Roots. when it comes to the Creole versus African born proportions Cape Verde is most comparable to Saint Lucia and Saint Kitts, having a locally born majority of about 80% of all slaves. when it comes to specified African origins the Cape Verde census is regrettably very limited, only providing ethnic details for 2,5% of all slaves. Only Anguilla had a similar minimal specification rate. Trinidad’s slaveregister is showing the strongest contrast with Cape Verde’s, both because of its high proportion of African born slaves (54%) as well as the degree the Trinidadian captives had their origins specified (32%). as for the actual African origins being described it’s very apparent that Cape Verde’s slave census almost exclusively mentions Upper Guinean roots while the West Indian slave registers cover the whole spectrum of Afro-Diasporic origins (from Senegal to Mozambique). Eventhough this 1856 census is therefore limited in scope it’s still a very precious historical source because surviving documented references to African ethnicity within Cape Verde itself are few and scattered for the previous centuries. However by studying the slave ethnonyms for slaves from Upper Guinea living in Iberia, the Hispanic Americas and Brazil we can get more insight into the possible ethnic composition of Cape Verde itself. 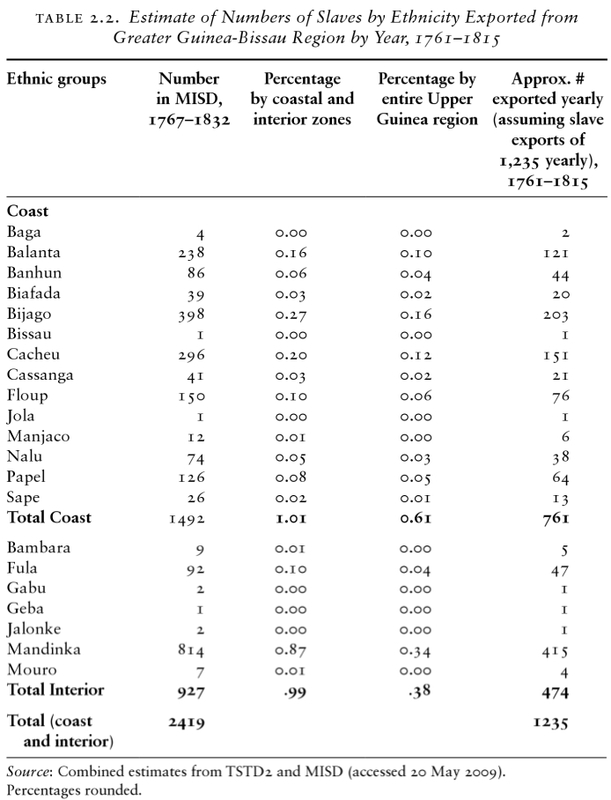 For a more detailed discussion see this page: Ethnicities of Upper Guinean Slaves. 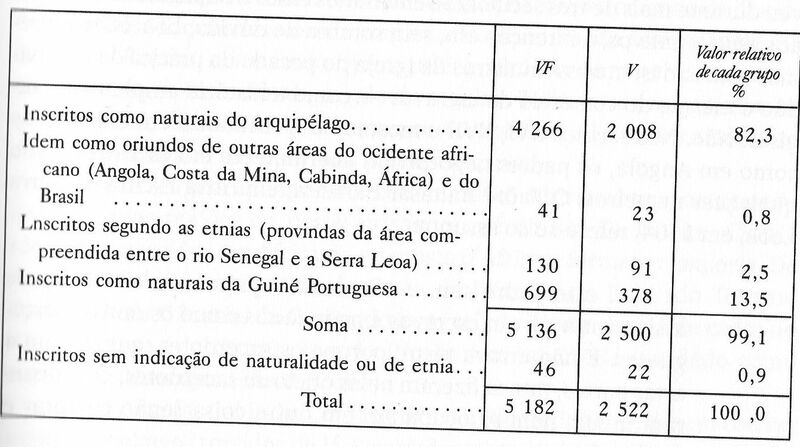 In order to establish how consistent the ethnic breakdown of this 1856 slave census might be despite its very low samplesize it’s especially helpful to look at the documented ethnic origins of Upper Guinean slaves in northern Brazil. Starting from atleast the 1750’s the main destination of captives being exported via the Portuguese slaveports of Cacheu & Bissau (both located in modernday Guinea Bissau) had become northern Brazil and more specifically the state Maranhão. Because of its empoverished economy and limited demand of slave labour Cape Verde was a very neglible destination as can be seen from the second last chart, only 1,7% of all slaves exported via Bissau ending up in Cape Verde. However the main thing to keep into consideration is that the ethnic origins of these captives would be similar to those being transported to Brazil. 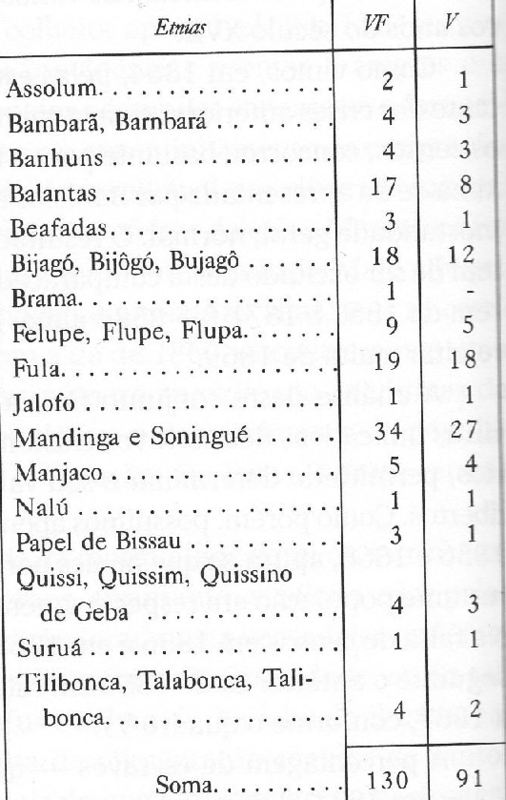 The only main difference is that the Fula appear more prominently in the Cape Verdean census and the Papel more so in the Maranhão records, but it’s clear that proportionally they were significantly present in both places. Even when this slave census was taken at the very end of slavery in Cape Verde and also keeping in mind that most of Cape Verde’s African origins actually date from earlier than the 1700’s, we may now cautiously assume the following. The ethnic compostion of Upper Guinean slaves within Cape Verde in between 1750-1850 was very likely reflecting a more inland sourcing of slaves than in previous centuries even with the continued major combined presence of coastal peoples like the Bijago and Papel (see Regional Origins for more details). This goes well with the known history of increasing warfare in this same period between the Mandinga kingdom of Kaabu and the Fula from Futa Jallon. Again it’s probably only a minor part of Cape Verde’s overall African origins that’s being reflected in the 1856 Slave Census but it does seem to offer a fairly accurate representation of its most recent ones. 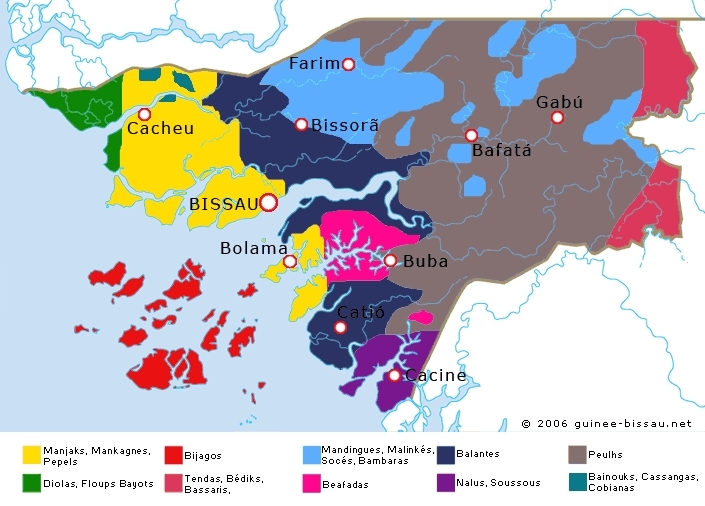 There is actually a considerable overlap between the ethnic groups living in Guiné Bissau’s interior (especially the Fula/Peulh and Mandinga) and its neighbouring countries as can be seen in other ethnolinguistic maps posted on this page. However even when being one of the smallest African countries Guiné Bissau has a great variety of ethnic groups unique to its territory and neighbouring Casamance. Many of whom have been described in great detail already since the 1500’s by Cape Verdean travellers. And interestingly their ethnic names have remained pretty much the same throughout historical documentation. In the second part of this blogpost i will explore the origins of the slaves who were mentioned specifically with an origin outside of presentday Guiné Bissau/Casamance. These being the: ‘Assolum’ (=Wasulunké), ‘Bambara’, ‘Jalofo’ (=Wolof), ‘Quissi’ (=Kissi), ‘Surua’ and ‘Tilibonca’ (see first chart above). However in this section i will focus on strictly Guinean Bissau groups found chiefly near the coast or along the many rivers even when many of these groups are actually also to be found in Casamance. The exception being made for this region in southern Senegal is historically warranted. Because this province was ceded to the French only in 1888 and a Portuguese-based Creole is still being spoken there, testament to the strong connections between Casamance and Guiné Bissau! Both regions also share a history of advancing Mandinga & Fula states from the interior which caused conflict and displacement but also culturalization for most ethnic groups. ‘Banhuns’, or Bainuk, nowadays much reduced in number and affected by Mandinga assimilation. In Mandé language their name is supposed to mean ” those who retreat”. ‘Balantas’, the most numerous ethnic group of Guiné Bissau nowadays but most likely not so during the 1500’s/1600’s. In Mandé language their name is supposed to mean “those who resist”. ‘Beafada’, also known as Biafada or ‘Biafara’, not to be confused with Bight of Biafra!. They probably used to be the most numerous group within Guinean’s borders but nowadays they are a small minority and heavily influenced by neighbouring Fula and Mandinga. ‘Bijago’, from the Bissagos islands, probably one of the oldest ethnic groups residing in the area, heavily involved in the slave trade but also fiercly independent minded. ‘Brama’, a.k.a. Buramo or also ‘Bran’ in the Hispanic Americas, used as a blanket term for Papel speakers but perhaps originally a subgroup living near the main slave port of Cacheu. ‘Felupe’, or Floup, sometimes incorrectly taken as a variant of Fula, however this name is referring to the Diola/Jola! Well known for their rice cultivating skills and assumed to be among the oldest ethnic groups in Casamance. ‘Manjaco’, or Manjack. Closely related to the Papel, this ethnonym only seems to have been documented during the 1800’s, while earlier they might have been grouped with the ‘Bram’. Intriguingly their name has become a generic term for West African migrants in modernday Cape Verde, not only referring to Upper Guineans but also people from Ghana or Nigeria! ‘Nalu’, also residing in Guinea Conakry, their un-accomodating attitude towards trade with foreigners was commented on often by historical travellers in the area and contrasted with the commercial mentality of the neighbouring Beafada. “Papel de Bissau”, a direct reference to Papel speakers within the Bissau area, which became the main slave port of Guiné Bissau in the 1700’s when previously it had been Cacheu. Despite being heavily involved in trading with the Portuguese for centuries they managed to stay independent till the late 1800’s. Reviewing the Cape Verde slave census of 1856 it’s first of all striking that 699 persons, 13,5% of the total, were merely described as having regional origins from within ‘Guiné’ or one of its main slave ports ‘Bissau’ and ‘Cacheu’. While specified ethnic origins were only mentioned for 130 persons, 2,5% of the total (see second chart). So obviously there’s a limitation of the data right there as we can’t be sure of the ultimate ethnic origins of these 699 “Guinean” captives. Still given the discussion in the previous section the ethnic breakdown in the Cape Verde census might yet be reasonably representative. Another striking aspect then becomes the relatively predominant presence of the Bijago, Balanta and Felupe (=Diola/Jola) when compared with the Papel/Bram and Beafada. These last two ethnic groups were easily the most frequently mentioned origins of Upper Guinean slaves in the Hispanic Americas during the 1500’s/1600’s (see this page, also ‘Bran’ or ‘Biafara’ being used). For this reason i personally consider them to be among the top 5 most significant ethnic origins of Cape Verdeans (for more discussion see Top 20 Ethnic Roots). Because as mentioned already the earlier timeperiods would have had a crucial impact on Cape Verdean ethnogenesis while this 1856 census can only represent a minor proportion. It seems however that an ethnic shift ocurred which caused the share of the Balanta, Diola and Bijago to increase during the 1700’s/1800’s even when in earlier times they were described as being very hostile to traders in general and unfit as slaves in particular. Also especially the relative share of the Beafada decreased in later timeperiods. It is known they were particularly badly hit by the mayhem caused by constant slaveraiding but not so it seems the Papel, also judging from the Maranhão data. It might be that each ethnic group devised different strategies to cope with the pervasive slave trade within Guiné Bissau and also with different results for their demographics. Several excellent books have been written about this topic, which i will discuss in a future blogpost further highlighting these Guinean Bissau/Casamance groups. All of them great people who ought to be known by their distinct proper names by any Cape Verdean wanting to learn more about their roots from ‘Guiné’! – Seibert, G. (2013). Creolization and Creole communities in the Portuguese Atlantic: São Tomé, Cape Verde and the Rivers of Guinea in comparison, in Toby Green, ed., Brokers of Change: Atlantic Commerce and Cultures in Pre-Colonial Western Africa, 29-53. Thank you! Hope you had a good Independence day too. It’s funny how the dates for Cape Verde & the US are so close.